I’ve been reading “The Blue Sweater: Bridging the Gap Between Rich and Poor in an Interconnected World” by Jacqueline Novogratz, founder of the Acumen Fund. Visionary founder of Manna Energy and Fragile Oasis (and Astronaut) Ron Garan told me about the book. 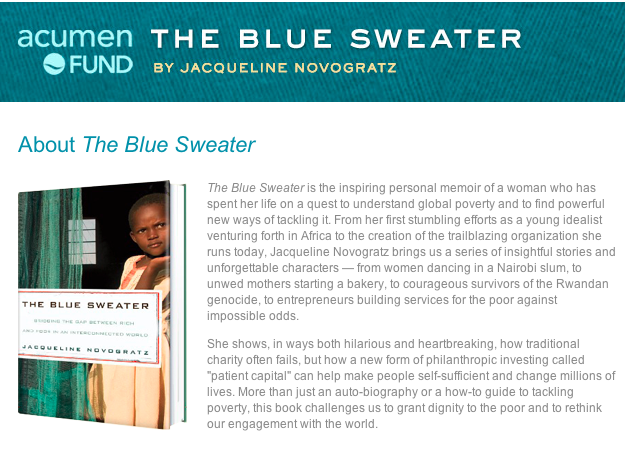 The Blue Sweater is a heartfelt, heartbreaking story of Jacqueline’s incredible journey to create economic independence for poverty-stricken African women, and her relationships with survivors the Rwandan genocide in the mid-1990’s. I find the story both uplifting and discouraging. Uplifting because of the author’s success in creating innovative investment strategies to help relieve poverty. Discouraging because I don’t feel I’ve done enough in my life to help others. I want to make a difference. To contribute. To make life better for others. Most days, however, I feel lucky just to survive the drama created by others, and smile in the midst of it. I often forget to be thankful for my job, a roof over my head, reliable transportation, running water, electricity, plumbing, and food. Think of all the people around the world who don’t have these basic necessities we take for granted. Though I always thought I would be a missionary or serve in the Peace Corps or do something noble and extraordinary, I’ve somehow served my entire career as a federal bureaucrat. We bureaucrats take a great deal of abuse in the press, but I see the role differently than most. In my mind, Civil Servant = Missionary for Public Good. No, I’ll never be a Jacqueline Novogratz, but at least I can help create Public Good — even in tiny quantities. Take our LAUNCH sustainability forums, for instance. We recently hosted the LAUNCH:Health at the Kennedy Space Center. For me, LAUNCH is an opportunity to make this world a better place while demonstrating the relevance between life on Earth and the extreme environment of space. We created LAUNCH as a problem-solving conversation around disruptive innovations that might make a difference in our world. The LAUNCH forums give thought leaders a venue for evaluating creative ideas among peers and joining in collaborative, solution-driven discussions. Here are tweets about our LAUNCH:Health Innovators. One of our LAUNCH Council, Simon Waddington, Entrepreneur-in-Residence at Burrill and Company, had this to say of the LAUNCH:Health experience. Maybe someday we’ll have a Blue Sweater story of our own about the LAUNCH Innovators we’ve helped propel toward success. Maybe someday we’ll see real change in how we live our lives on Earth because of what NASA brings to the problem-solving conversations. Maybe, just maybe. And in this very tiny way, I get to help change the world — one innovation at a time! This is it! The week we host LAUNCH: Health, the second in our series of sustainability incubators. NASA partnered with USAID, Department of State, and NIKE to create the LAUNCH initiative to identify, showcase and support innovative approaches to global challenges. Through LAUNCH, NASA can host a global conversation about innovative solutions. We’re problem-solvers, after all. That’s what we do best. Sustaining quality of life on Earth and in space requires transformative advances in science and technology, along with new models, policies and behaviors that will guide human development. The search for innovative technology solutions to ensure healthy astronauts orbiting the planet mirrors healthcare challenges faced by providers throughout the world. The same requirements for simple, rugged, ultra portable, low power devices to provide remote diagnostic capability serves dual needs for humans living within the extreme environments on and off the planet. David Van Sickle, Asthmapolis: a devise to track and measure a patient’s self-treatment for asthma by attaching a GPS receiver and rechargeable battery to a standard inhaler. Can also be used to monitor air quality…. Gijsbert van de Wijdeven, Bioneedle: a biodegradable needle that dissolves under the skin releasing the vaccine, leaving behind no waste products. No medical professional is required to deliver the injection, which is inserted with an air compressor. Erick Toledo, The Chlorine Bank: a grocery-story-style supply chain network to provide low-cost chlorine-based water purification products to rural communities. Dieterich Lawson, FrontLine SMS Medic: text messaging solutions that connect doctors and patient medical records with remotely-located healthcare workers and their patients. Ben Reis, HealthySocial/Food Hero: a social media-based game that fights obesity by teaching children about healthy eating and exercise as they care for a “troll” that can only perform when healthy. Matt Sanders, Imetrikus Medi Compass Connect: networked technology to connect chronic pain patients with their doctors on a regular basis through home monitoring devices connected via computer, modem, or smart phone. Aydogan Ozcan, LUCAS: A miniaturized microscope attached to a cell phone that detects parasites and bacteria in blood and water in remote locations. Samuel Sia, mChip: Lab-in-a-box. A handheld device that can analyze diseases — such as HIV, syphilis, hepatitis, and other sexually transmitted diseases — in 15 minutes from a drop of blood. Ramesh Raskar, NETRA: portable eye doctor (minus the physician). A small measuring device that administers an eye test and determines necessary correction with the touch of a button. Jonathan Attwood, ZamZee: a handheld device for kids to encourage and record movement, and reward physical activity with virtual shopping credits. We’ll be streaming the presentations live. Stay tuned for details on LAUNCH.org website. We’re also pleased to welcome our LAUNCH Council to the Kennedy Space Center. You can find their bios on the LAUNCH.org website. They represent diverse backgrounds from entrepreneurs to scientists and engineers to venture capitalists to leaders in government, media and business, who will help to guide the innovators as they move forward toward successful implementation of their products and ideas. Our hope is that they see begin to see “space” in a new light as an integral part of the global sustainability conversation. LAUNCH: Water was our first forum back in March. We have Mark Tonkin, one of our LAUNCH: Water Innovators, coming back to talk with the group this weekend. We’re hoping to bring in Astronaut Ron Garan for a quick hello. Ron, you may recall, was one of our LAUNCH: Water Innovators for his humanitarian effort to bring clean water to children in Africa through Manna Energy. He’s down at the Space Shuttle launch, and is one of our STS-133 Tweetup speakers. Yes, it’s going to be a busy, amazing week! We’re also hosting 150 enthusiastic STS-133 tweeters at the press site, AND, let’s not forget the Space Shuttle launch inself, which is what this fuss is all about in the first place. The STS-133 crew will leave the boundaries of Earth onboard Space Shuttle Discovery for her final flight on Monday, November 1 at 4:40 p.m. EST. If you want to participate in LAUNCH: Health, we have several options for you. You can watch the Innovator presentations via U-Stream. You can also interact with us through NASA Mind Mapr, cousin of NASA Buzzroom. Mind Mapr offers web-based virtual participation for you by allowing you to create an account to log into the system to add comments or pose questions. You can also follow the LAUNCH twitter account. Crosspost on OpenNASA and GovLoop.